I came up with this cozy idea a few weeks ago when the cold weather really started to set in. I love the idea of portable heat sources that use little energy and allow me to roam freely around my cold house (I generally keep the thermostat at 60 degrees all winter.) The owl cable came from an old Leisure Arts vest pattern I was given a few years ago. 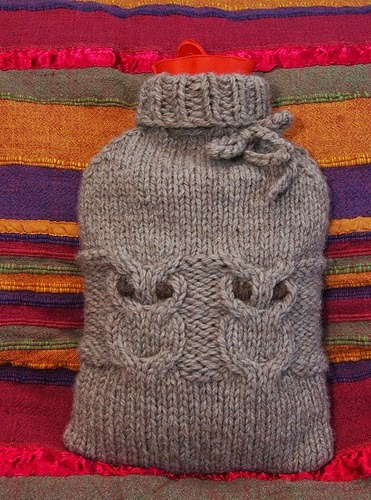 This cozy will dress up any standard 2 liter hot water bottle and it will keep it warmer longer. Yarn: 1 ball Cascade Ecological Wool in color 8061 (project uses approximately 140g.) or two hanks of Blue Sky Organic cotton, about 2 yds of darker colored natural fiber yarn for the eyes. Notions: tapestry needle for weaving in the ends and embroidering the eyes. Project is worked using 2 strands of yarn held together throughout. c4f: Sl 2 sts to cable needle and hold in front, k2, k2 from cable needle. c4b: Sl 2 sts to cable needle and hold in back, k2, k2 from cable needle. Using the figure 8 cast-on method*, Co 52 stitches on two dpns (26 stitches on each needle). Rnd 1: Knit first rnd onto two needles and redistribute onto 4 needles at end of rnd. Place marker to mark the beginning of the rnd. Using the crochet hook, create a 21" crochet chain and weave it through the eyelets at the base of the neck. With the darker yarn and the tapestry needle, embroider over the purl stitches that make up each owl's eyes using the satin stitch. project you can simply seam the bottom of your cozy. To use- Slide water bottle into cozy, secure with tie, and fill with hot water. Thanks for posting the pattern. I have that Leisure Arts vest pattern....I made my children the vests when they were little, and now that they're grown I can make them hot water bottle cozies. Finally! You found a hot water bottle. Sarah actually found it when she was placing an order for medical supplies. I just made this for my dad for fathers day. It's a great pattern-knitted up really nicely, thanks! Please feel free to send us more patterns, or let us know if you prefer us not to link to you. We also use projects in our newsletters. I need cold more than hot -- so I might consider doing this cutie for my ice pack!! Folks, did you use two strands of yarn to make this? The woman at my local knitting store recommended that I don't do that - that it will be too thick. I'm wondering if the two strands mean two ply, which my yarn is already. I am using Eco Super Alpaca yarn. Yes, it was done with two strands of Eco Wool (aran weight) held together. Hi, I have just finished knitting this. It looks great. But ai am trying to work out how to fit the hot water bottle into the cover. Is it somehow supposed to fit inthrough the small hole which is the neck? The water bottle is soft and when empty can be curled up to fit through the hole.